Wadi El-Hitan, Egypt's only natural heritage site on the UNESCO World Heritage List resembles a lunar landscape dotted with fossils of species over 40 million years old. 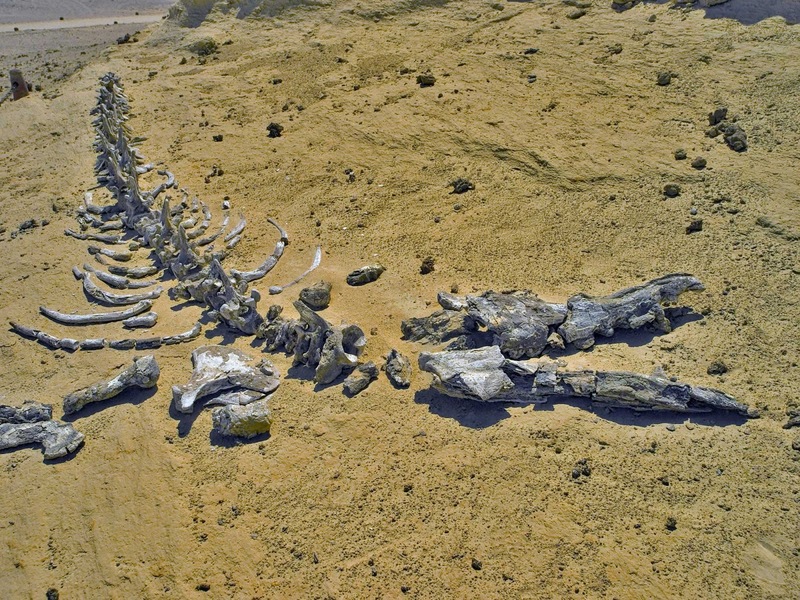 "Wadi El-Hitan is the most important site in the world to demonstrate one of the iconic changes that make up the record of life on Earth: the evolution of the whales. It portrays vividly their form and mode of life during their transition from land animals to a marine existence" – The World Heritage Committee. Pigs cannot fly, but whales can walk, or better said, could walk, and they once roamed parts of present-day Egypt until, one day, something happened … something that can be understood better today thanks to the fossils at Wadi El-Hitan (Valley of the Whales), declared a UNESCO World Heritage Site in 2005. As the World Heritage Committee put it "It exceeds the value of other comparable sites in the world in terms of the number, concentration and quality of its fossils, and their accessibility and setting in an attractive and protected landscape." That "attractive landscape" is more of a lunar landscape really, thanks to the brushstrokes left by one of nature's most impressive artists: erosion. These natural "brushstrokes" add to the mystery that enshrouds the site, but then the real storyteller here is an impressive collection of fossils and bones, some of which date back over 40 million years. The first question that comes to the visitor's mind is one of geography: what are these marine fossils doing in the heart of the desert? The answer has to do with what we can call the "sadness of geography," or more precisely, the calamities of climatic change. The Original UNESCO Inscription of Valley of the Whales is Here!!!. Some of the fossils that the visitor can marvel at today include sea turtles, sea cows, sawfish, rays, oyster shells and mangrove roots, but the heavyweights of the site are — expectedly — the whale fossils, preserved thanks to Africa's greatest gift to Egypt since the dawn of time: silt and sediment. There came a time when Wadi El-Hitan was not a valley at all, but rather a seabed. What we call the Western Desert of Egypt was once submerged under the Tethys Sea. As the water slowly receded, a new coastline came to emerge and the whales might have approached the coast for food or for giving birth and then got stuck by the tide. Alternatively, they might have died far from the coast and drifted by the wind and the ebb to the coast, where their dead carcasses got trapped in the mangrove roots. Theoretically, there are many reasons why the ancient whales took to the seas. Maybe they needed more space or more food, both of which were found in the sea, or maybe they were forced into the sea by bigger predators. In all cases, the evolutionists believe that the whales adapted to the sea environment through natural selection. 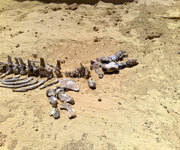 Fossils of two whale genera are abundant at Wadi El-Hitan, the first of which being the Basilosaurus (King Lizard), averaging 18 metres. 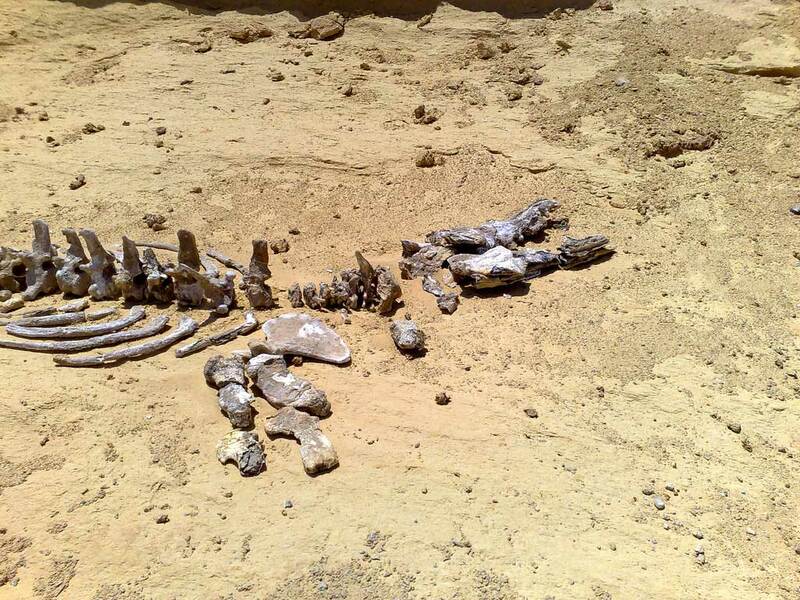 Evidence suggests it fed on another whale called the Dorudon (Spear-tooth), averaging five metres, also abundant at Wadi El-Hitan. When toothed whales were first discovered, scientists thought they were actually reptiles, calling them Basilosaurus (which means King Lizard) since its slender shape evokes images of a giant sea-serpent. Later on, when they realised that these creatures were actually whales, they wanted to change the name to Zeuglodon, meaning yoke-shaped teeth. Nevertheless, the name Basilosaurus stuck, being the name earlier adopted. Despite the lack of resources, the site makes for an unforgettable experience. It is one of the few properly interpreted heritage sites in Egypt, with very informative signposts and a small-but-tidy visitor centre. Unlike many other sites in the desert, you do not need a 4x4 to visit Wadi El-Hitan: there is a short hiking trail (1.5 hours) and a longer trail (2.5 to three hours), both with shaded shelters for visitors to rest along the trail. Many tourists find it a good idea to combine Wadi El-Hitan with Wadi El-Rayyan or Tunis Village in a one-day trip, but those with a passion for geology or paleontology will find it difficult to leave the site for anything else. This is not to say that the site is damage proof: the fossils are in the open, subject to the scorching sun and to any human intervention since there is no video surveillance. No rangers or guides accompany visitors, unless visitors want company. Memories of the damage done by Belgian diplomats in 2007 are still alive, and another strange episode took place in 2010 when the skeleton of a whale from Wadi El-Hitan that was studied and restored in the US got "stuck" at Cairo Airport due to customs row. The skeleton is the only complete specimen of the species Basilosaurus Isis in the world. Problems apart, the whole site resembles an open-air museum with marked trails and itineraries that visitors can follow to admire the fossils and rock formations that extend over a vast area, unique in the world. Browse All UNESCO World Heritage Sites in Egypt.